Cross that crazy cat person off your holiday gift list. The folks over at Gatefeeder have just what you need with the recent debut of the RFID-equipped Gatefeeder cat feeding system. 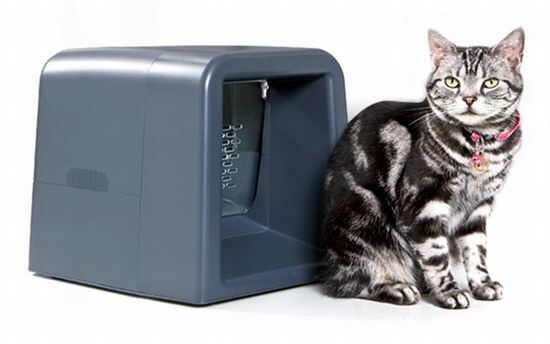 The controlled feeding solution for cats uses a Gatefeeder developed collar mounted Smart ID equipped with RFID sensor technology to enable one designated cat access to food within an enclosed space. Gatefeeder guarantees all food – canned, kibble, a special diet or medication goes straight to the right cat, while simultaneously keeping mess and odors contained. It eliminates completive eating if there is more than one pet in the household and prevents neighborhood animals from inviting themselves to dinner. Gatefeeder can store and keep fresh up to a weekend’s worth of food for an average cat. One meal of canned food can be kept cool using an ice pack for up to 10 hours. The batteries will last 8 to 12 months, and a low battery LED indicator will flash to signal when batteries need changing.